Do you love to cook? Love to find new an exciting healthy recipes for you and your family? Make sure to check out Aetna Healthy Food Fight. You can enter for your chance to win an amazing contest. Four regional winners will be flown to New York City to cook for celebrity chef, Bobby Flay. 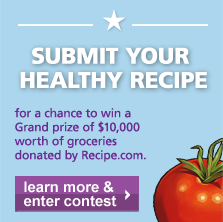 The national champion will win the grand prize of $10,000 in groceries donated by Recipe.com. If you love cooking and eating right, then this is right up your alley. 1. Start with one of your own great healthy recipes. 2. Select the region in which you want to compete. 3. Register for the contest, and enter your recipe into our Healthy Recipe Analyzer to determine if it meets the nutritional requirements to be included in the voting for the semifinal cook-off. If your recipe receives a score of C+ or higher, it will be officially entered. Then spread the word to get your friends and fans to come vote for your recipe when voting begins. Up to 48 people with the highest-rated recipes will qualify to compete in person. For more info make sure you check out the info banner below! Good Luck!! And if you win, feel free to invite me!